Since the beginnings of Zionism in the twentieth century, many Jewish thinkers have considered it close to heresy to validate life in the Diaspora. Jews in Europe and America faced “a life of pointless struggle and futile suffering, of ambivalence, confusion, and eternal impotence,” as one early Zionist philosopher wrote, echoing a widespread and vehement disdain for Jews living outside Israel. This thinking, in a more understated but still pernicious form, continues to the present: the Holocaust tried to kill all of us, many Jews believe, and only statehood offers safety. But what if the Diaspora is a blessing in disguise? 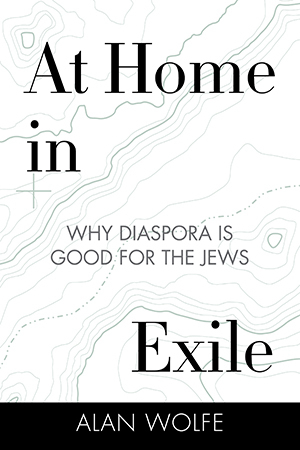 In At Home in Exile, renowned scholar and public intellectual Alan Wolfe, writing for the first time about his Jewish heritage, makes an impassioned, eloquent, and controversial argument that Jews should take pride in their Diasporic tradition. It is true that Jews have experienced more than their fair share of discrimination and destruction in exile, and there can be no doubt that anti-Semitism persists throughout the world and often rears its ugly head. Yet for the first time in history, Wolfe shows, it is possible for Jews to lead vibrant, successful, and, above all else, secure lives in states in which they are a minority. Drawing on centuries of Jewish thinking and writing, from Maimonides to Philip Roth, David Ben Gurion to Hannah Arendt, Wolfe makes a compelling case that life in the Diaspora can be good for the Jews no matter where they live, Israel very much included—as well as for the non-Jews with whom they live, Israel once again included. Not only can the Diaspora offer Jews the opportunity to reach a deep appreciation of pluralism and a commitment to fighting prejudice, but in an era of rising inequalities and global instability, the whole world can benefit from Jews’ passion for justice and human dignity. Wolfe moves beyond the usual polemical arguments and celebrates a universalistic Judaism that is desperately needed if Israel is to survive. Turning our attention away from the Jewish state, where half of world Jewry lives, toward the pluralistic and vibrant places the other half have made their home, At Home in Exile is an inspiring call for a Judaism that isn’t defensive and insecure but is instead open and inquiring. One thing I had noticed about the academic study of religion is that scholars invariably study their own. I do not just mean that Mormons write books about Mormons or Catholics about Catholics. It goes deeper than that: mainline Protestants typically observe people much like themselves, as do Orthodox Jews. My membership in none of the above, it turned out, had given me something of an academic advantage. I may have lacked the insights that come from lifelong involvement with one particular faith. But in return I was widely viewed as someone writing about religion with no particular axe to grind. When a referee was needed, there I was. Those I studied generally treated me as an outsider but also as one making a special effort to understand them. Far from feeling excluded from their world, I felt, if anything, a bit wary about the warm embrace they offered. Yet the fact that I had spent so much time among deeply religious Christians made me increasingly aware of two ways in which my differences with them were insurmountable: I was Jewish by background and nonreligious by conviction. For me, the two had always been intertwined. My parents were not themselves religious, nor for that matter strongly committed to any ideology. (I recall my father telling me that when he grew up, everyone he knew was either a socialist, a communist, or a Zionist, but that he had managed to avoid all such identification.) Nonetheless my parents felt Jewish enough to arrange a bar mitzvah for me, and so without much conviction on their part or mine, I did my religious duty at the age of thirteen. That has pretty much been it. I do at times read the Old Testament—the prophets in particular appeal to me—but I cannot say that the angry God pictured therein is one I find especially attractive. It is not just that I have a hard time envisioning God creating the world and then meddling with it when we human beings displease him. The religious side of Judaism is as much about practice as it is about belief, and even in this realm I feel no urge to honor the tradition by following rules that at best seem arbitrary and at worst absurd. Although I know my share of rabbis, and even though I admire their learning and commitments to social justice, I cannot bring myself to regularly attend the synagogues of any of American Judaism’s major branches. The only times I enter a shul are when I am invited to speak in one. I study religion but do not practice it, not even the one in which I was ostensibly raised. The historian David Biale makes a distinction between two different varieties of Jewish secularism. One is represented by the biographer of Leon Trotsky, Isaac Deutscher, who called attention to the non-Jewish Jew: thinkers such as Karl Marx and Sigmund Freud (as well as Baruch Spinoza and Rosa Luxemburg) who because they “dwelt on the borderlines of various civilizations, religions, and national cultures” could “rise in thought above their societies, above their nations, above their times and generations, and . . . strike out mentally into wide new horizons and far into the future.” The other secular tradition, according to Biale, involves thinkers who, however much they rejected Judaism as a religion, were steeped in Jewish history, identified with Jewish suffering, or were inevitably shaped by everything from which they had hoped to escape. In this latter category, Biale includes figures such as the poet of the Statue of Liberty Emma Lazarus, a Jew of Sephardic background, as well as nearly all the leading Zionists of the late nineteenth and early twentieth century, for whom nationalism rather than faith became their creed and cause. Biale does not want to conflate these two categories; calling thinkers Jewish just because of their background strikes him as verging on “a kind of racial determinism.” As someone who does not consider himself as alienated as those in one of his categories or as conversant with Jewish sources as those in the other, I am not convinced that Biale is correct. For one thing, it is almost impossible to assign some key thinkers to either category; Freud, by example, is included by Deutscher as a non-Jewish Jew but also discussed by Biale because he wrote a book about Moses. In addition, times have changed, severing secular Jewish intellectuals, especially in the United States, from the immigrant experience that had once kept Hebrew and Yiddish culture alive. The most important reason, however, is that both kinds of secularism, at least before Israel came into existence, were shaped by the experience of exile they shared, as Deutscher so strongly emphasized. In the absence of boundaries within which membership is defined by a state, exilic people such as the Jews honored remembrance—or Zakhor, as they call it—by clinging to their history. They also attached special importance to the written word while tolerating a certain amount of ambiguity in the meaning of those words. Lacking armies, they came to appreciate that arguments were more likely to be settled by winning others over to your ideas than by taking over their land. Whatever one’s level of identification with matters Jewish, these were the traits that tied all Jewish secularists together in the absence of a unified political collectivity. All this helps explain why those who have never read the Talmud can be so influenced by all those Jews of yore who did little else. The great Hebrew scholars of the past bequeathed to us who live in more fortunate times the opportunity to build upon their tradition and push it into territory that has little to do with how God’s commands ought to be interpreted or what holidays should be celebrated and why. This Talmudic heritage, I believe, explains how I can feel Jewish without in any deep sense being Jewish. There was a time when religious Jews believed in God and argued furiously about him. There is now a time when huge numbers of fully assimilated Jews do not believe in God—and argue about everything anyway, including God. If the Jewish religion has been one long argument, I am home in that faith however much I fall short on knowledge of Hebrew, trips to Israel, or attendance at services. As with religion, so with ethnicity. I take great pride in the accomplishments of particular Jews. Some of my friends consider it odd that I seem always to know that a composer, writer, or politician is Jewish, even when their name, such as Lorenzo Da Ponte, gives no hint that he or she might be. (Da Ponte not only wrote the libretti to the great Mozart trilogy of The Marriage of Figaro, Don Giovanni, and Così Fan Tutte, he also became, in turn a Roman Catholic priest, a grocer in Pennsylvania, and a professor of Italian at Columbia University.) If I learn that the first Lord Snowdon, Anthony Armstrong Jones, the husband of Princess Margaret, was descended from a German Jewish financer, or that the actress Gwyneth Paltrow comes from a long line of rabbis and publishes her seder recipes online, those facts stick with me, seemingly forever, just as I happen to know the number of Boston Red Sox players of Jewish background in 2006 (four: Kevin Youkilis, Gabe Kapler, Craig Breslow, and Adam Stern). Other people collect china or stamps; I collect ethnicities. For all my belief that I am who I am because of what I have done, there lingers a sense that what I have done is at least partially explained by who my ancestors were. At the same time that I am fascinated by the accomplishments of individual Jews, however, I bristle at the idea of Jewishness as a fixed category. Liberal universalism, in my view, should have little to do with tribalism; the whole point of there being ethnic groups is so that people can pick and choose between the best and worst of all of them. There was a time in my life when I was attracted to the idea that unencumbered selves, lacking strong ties to community, were incomplete, isolated, and therefore alienated from the society around them. But then I saw how quickly groups can become self-protective entities, requiring their members to suspend critical judgment in solidarity with what is, in the final analysis, an abstraction. For the same reason I so strongly disliked the statements of faith required by evangelical colleges, I reject the loyalty oath that says anyone who criticizes his or her group is disloyal to it. This overall fascination with ethnicity during the past few decades, I believe, has produced too much interest in the group and too little in the individuals who compose it. The past three or four decades have witnessed the creation of numerous departments of Jewish studies. While such departments attract people with all kinds of views, including those quite critical of Zionism, and even though I have relied on their research in writing this book, too many of them promote a self-defensive mentality in which anti-Semitism is all too often portrayed as never ending and Jews are held innocent for whatever transpires in the Middle East. Outside academia, it especially concerned me that the New Republic, a magazine I loved and that had honored me by naming me a contributing editor, and to which I was attracted because it was so critical of the trend toward identity politics of other groups, published the anti-Arab mutterings of its former editor-in-chief Martin Peretz. (My relationship with TNR ended in 2013.) Special pleading, and of the nastiest sort, had not only won out in the field of politics, it had also become prominent in the world of letters. The wishy-washy Judaism in which I had been raised was neither devout nor observant. But at least it wasn’t ugly. Although I wrote this book against this tendency for Jews to put Jews first, I do not think of myself as a lonely dissenter confronting all the forces of the Jewish establishment, and not just because that establishment, as I have argued in this book, is beginning to crumble. In truth, there are many Jews like me. We have our own identity, so to speak, one in part shaped by Jewish history, culture, and faith, but one also influenced by the special privilege of living among others with different faith traditions. When I think of what being Jewish means to me, neither the Maccabees nor the Anti-Defamation League come first to mind. What does instead is the world of the Haskalah. It goes without saying that, in Amos Elon’s words, it was a “pity” that it all came to an end, and in so brutal a manner. But there is no reason why enlightenment cannot live once again, if not in precisely the form it did then. Call this book, written in what used to be called old age, a return to what was around me but not especially visible to me when I was young. Not especially concerned with Jewish life in the glorious years when Israel came into being, I find myself preoccupied with Jewish matters when Israel is losing so many friends. My aim is not to add my name to its enemies list; I hope I have made clear throughout that for all Israel’s problems, it is an established state that came into existence for justifiable reasons, and it ought to be allowed to find its way to a better future. Instead, I merely want to make my voice heard. Like so many others concerned about where Jewish nationalism has led, I prefer a Judaism that is special but not chosen to one that is chosen but not special. Jews survive best, for themselves and for the gentile world around them, when they do more than live but live up to an ideal. The End of Exile History?